How does a restaurant mobile app with a delivery system work? Wondering how does a restaurant mobile app with a delivery system work? The number of restaurants with their own online food delivery mobile app has increased by as much as 70%! 20% of customers say they use one at least once a week. (source) Your customers expect that they will be able to order food from your restaurant quickly and conveniently. A food ordering application makes this possible. 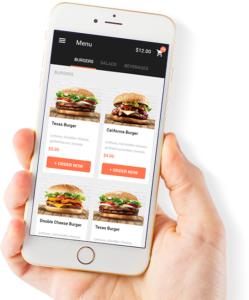 There are many reasons why you should decide to launch your own mobile app for restaurant ordering. An online food delivery mobile app will contribute to lower costs of handling orders online, more time for your team, and an increase in your profits. Launching a restaurant mobile app can be very simple. 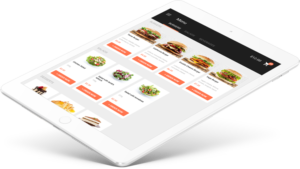 The UpMenu system allows you to build a native online food delivery application quickly and fully integrate it with a food ordering system on the restaurant website, all adjusted to the image of your restaurant brand. An online food delivery mobile app makes it possible for your customers to order food conveniently from your restaurant through a mobile application on their smartphones. 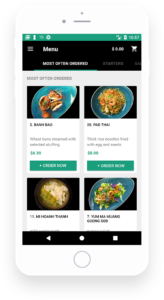 The UpMenu mobile app for restaurant ordering is a native application developed for iOS and Android devices, fully adjusted to the restaurant’s brand. The application’s native qualities ensure quick loading of subsequent pages so that the entire ordering process is fast and smooth. The intuitive layout also makes it possible to find everything quickly and place an order in the easiest way. All orders placed through the online food delivery mobile app are sent to the administrative panel of the UpMenu system where you can collect them with just one click. 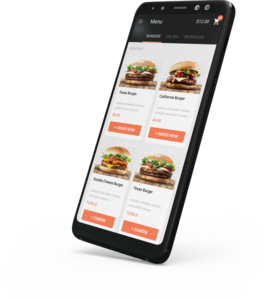 The restaurant mobile app makes it convenient for customers to place orders and also enables you to save time and the time of your employees when collecting orders. Actually, why would you need the UpMenu food ordering application? This means that customers expect that your restaurant will offer them the possibility of ordering through an online food delivery application. If you don’t meet these expectations, customers will start making orders from a competitor’s restaurant which offers such a possibility. With an online food ordering application you can present yourself as an entrepreneur who follows trends, while your restaurant will be shown as an innovative business that keeps in mind the convenience and needs of its customers. Thanks to the online restaurant applications, it also contributes to building brand awareness and encourages your customers to bond with it. After all, your restaurant will accompany them at all times on their smartphones. It will become their first choice when customers think about ordering food. What types of restaurants can use an online food delivery mobile app? Whether you manage a small, family trattoria or a large restaurant chain, the UpMenu food ordering application will be a great solution. Thanks to its functionality, one application can provide services either to customers of one location or several hundred locations operating under the same brand. In the case of one location, a customer accessing the application will simply be forwarded to the ordering page. The process is quick and thanks to easy adjustment of delivery zones, the customer will see the cost of food delivery immediately after entering the address. When the restaurant mobile app manages a chain, the customer will select the location of their choice first. For the customer, this will only involve completing one extra step in the order process. Each order will be sent to the location chosen by the customer. Only that particular restaurant will be able to collect the order. You, as the owner of the chain, will see statistics for all orders but managers of particular locations won’t have access to them unless you permit it. The choice is up to you! The type of cuisine also does not precondition the fact of launching an online restaurant application. 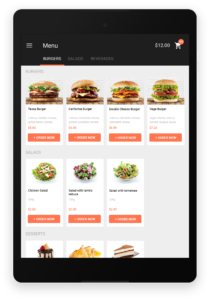 The UpMenu food ordering application has been designed to work with all types of restaurants. The many possibilities for creating menus can easily be adjusted to various types of cuisine. Good photographs and clever tile arrangement in the menu will help with increasing sales at sushi restaurants, where good presentation of dishes is very important. Sushi is one of the most frequently ordered meals in the UpMenu system. When you manage a pizza place, your customers will certainly like the possibility of choosing extras when placing an order. This step in the order process is very intuitive. Your customers will certainly return to order more pizzas, and you will earn more. At the same time, configuration of the same extras in the menu for a pizza place is very easy, which will help you save time. New restaurants that are just starting online sales will certainly appreciate the increased number of orders after launching the online food delivery mobile app. The numerous marketing features offered by the UpMenu system will be an additional advantage. They will certainly be useful when building your brand. Locations that cooperate with online food ordering portals can use the food ordering application as an alternative and pay less for services. Cooperation with food portals is associated with very high commission costs, while you will only pay a small monthly fee for the UpMenu restaurant mobile app. Hence, the UpMenu online food delivery application can be used by any restaurant. All that is needed are food delivery services or take-out services. The UpMenu online restaurant applications were developed for both main platforms and are available in the Google Play and AppStore. This means they are compatible with all Android and iOS devices. Their native qualities ensure effective operation and functionality. 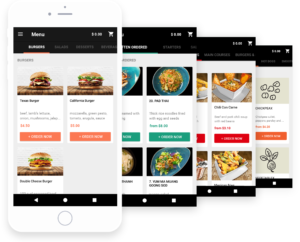 The android food ordering app is great for all Android devices and ensures smartphone users will be able to order food from your restaurant in a simple way, while the popularity of Android will provide you with an extremely large group of customers. UpMenu also enables you to upload the online food delivery application in the AppStore. 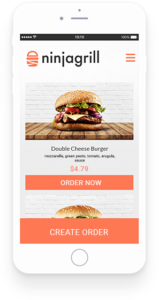 iPhone food ordering apps will help you sell food over the internet to Apple device users. This way, you will further increase your profit. The online food delivery mobile app is also ideal as a tablet ordering system. The application easily adjusts to the size of each tablet, making order processing easier for your customers. If you are looking for restaurant ordering software for iPad, try out the UpMenu restaurant mobile app. Customers who use those devices will be able to download the application for your restaurant from the AppStore so they can place orders easily. 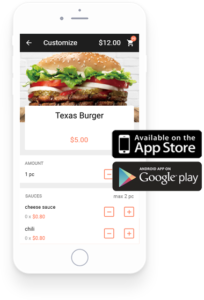 Launching a native restaurant mobile app for Android and iOS devices, will let your customers place orders in an easy way. And thanks to the popularity of such systems, you can be sure that the application will find its users. 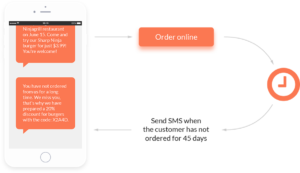 How can a food ordering application help you in your daily work? Significantly! Thanks to numerous additional features, it will be easier for you to plan the work of your team and handle more orders. This way you can earn more. The functionality and intuitiveness of the UpMenu restaurant mobile app will help your customers order faster while you can collect and manage their orders more easily. Developing and using a restaurant mobile app along with the UpMenu system compared to having a dedicated application by an agency, is a lot cheaper. A native mobile application for just one platform can costs as much as $100,000. (source) Additionally, you have to keep in mind that this is not the only cost. Software has to be updated and maintained. This will generate extra costs that you will have to incur if you want to have a food ordering application developed by an external agency. You also have to ask yourself the following question: to what extent will the application be functional for the customer and for you. A company that does not operate on the restaurant market does not really know its reality or the expectations of customers who place orders online. 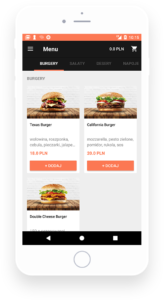 When you cooperate with UpMenu, you will receive a native mobile application fully adjusted to your restaurant, for the price of a low monthly subscription. Additionally, you will obtain access to new marketing tools, while technical support and services are also included in the subscription. Instead of paying several dozen or several hundred thousand Dollars for a non-functional solution, you will obtain an online food delivery mobile app adjusted to your restaurant. Customers will download the application with your logo from Google Play or the AppStore. Do you know what irritates your customers most? A busy telephone line when they are hungry and want to order food. An online food delivery mobile app eliminates this problem and enables your customers to place orders whenever they want. You can collect the order in a simple way while specifying the processing time. This saves time for both parties. When you think How does a restaurant mobile app work, it will solve your problems. Your customers will not receive a mistaken or incomplete order. 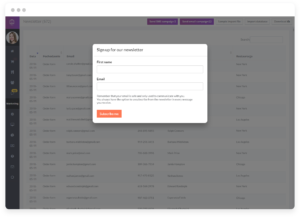 Your employees will see all the information regarding customer requirements on the screen, without having to note anything down. Thanks to such solutions, your customers will receive benefits in the form of ordering convenience and absence of mistakes. This will encourage them to place orders again and you will earn more. 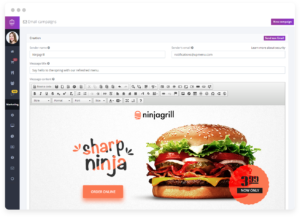 A food ordering application is a new sales channel for your restaurant. It will ensure new orders immediately after its launch. Thanks to the application’s functionality, your customers will return more often, which will generate more orders. Additional marketing tools will help you promote the restaurant and the online food delivery application itself, which will also increase the number of online orders generated. All this will convert into bigger profits for your restaurant. Online restaurant applications can be easily adjusted to the appearance of your restaurant. Add photos and change colours. All this will help you build a strong brand on the internet and in the minds of your customers. A well-designed and consistent brand will bring better associations to customers, making them return more often to order more. Along with the food ordering application you will launch fast online payments. This is a huge convenience for your customers. 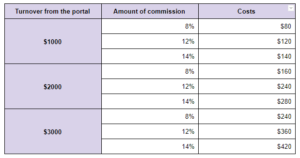 56% of all transactions are paid online. 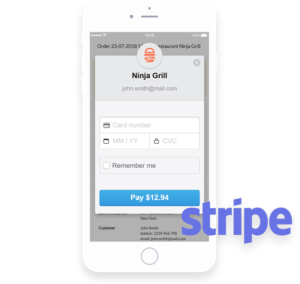 (source) Thanks to integration of the UpMenu system with Stripe, an international online payment operator, your customers can feel safe and be certain that the transaction is secure. This will encourage them to order more often. And you can also be sure that any order you process is not fake and is already paid when you start preparing it. 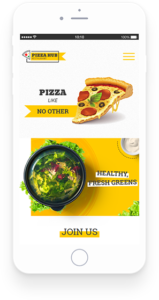 The UpMenu online food delivery application also provides marketing tools for your restaurant that support brand creation, encourage loyalty among your customers, and increase sales. Within the scope of the subscription you can benefit from all such features and generate more orders. A newsletter database is one of the biggest resources for your company. You can send campaigns that will encourage people to place orders to all your customers who granted consent for marketing communication. An online food delivery mobile app will also build a database for you automatically. When placing orders, the customers will agree to receive information regarding new products, events, and promotions. All your customers have the opportunity to write a review. It will be visible only to you because it will not be published on social media or restaurant forums. It will be sent only to the administrative panel of the UpMenu system. Such reviews serve as an early warning system – when something bad happens with an order, only you will be notified and you can decide how to respond to such feedback before the issue is discussed on social media. 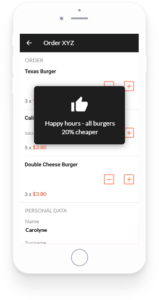 A restaurant mobile app together with the UpMenu system will enable you to generate discount vouchers for your customers, which will help you generate bigger sales. Customers love discount vouchers; 87% of customers use them. (source) This way, you can strengthen their loyalty and generate more orders. Of course, you will earn slightly less on an order made with a discount voucher; however, your restaurant is operating, raw materials are rotating in production, and satisfied customers will be happy to return. Even without a discount voucher. You certainly offer occasional promotions to your customers, for example, due to various types of holidays or larger orders. 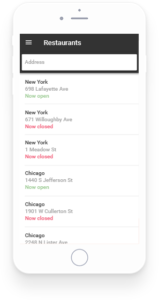 The UpMenu mobile app for restaurant ordering will let you create promotions, even with complex conditions, in the easiest possible way. You can create promotions for the second product, for the second identical product, an order with a specific value, etc. Discounts can be offered as a percentage or as an amount. You have full control over the promotions that you grant to your customers. An online food delivery mobile app can complete certain marketing functions for you! All you have to do is configure marketing automation. Thanks to the above, the UpMenu system will send messages to your customers in specific cases. You can thank them for placing an order or send a reminder to a customer who hasn’t placed an order for a specific period of time. When managing a restaurant, you have to make decisions frequently. If you have good business intuition, that’s great! Nevertheless, some decisions are better being backed by hard data. 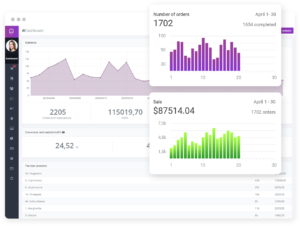 A food ordering application will generate automated reports for you that will tell you everything you need to know about the online sales of your restaurant. This is your command centre to help you make better decisions. Using the UpMenu restaurant mobile app you can send PUSH notifications to customers who downloaded the application. These are messages sent to users through the mobile application. It works in a similar way as when you receive a Facebook friend request notification. PUSH notifications will help you increase the engagement of your customers. You can encourage them to place orders and notify them about the latest deals in an even easier way! Such activities impact your customer’s loyalty. When they receive PUSH notifications they will order more and more often. This generates greater turnover at your restaurant and bigger profits for you. The loyalty programme is one of the best ways for building a loyal community of customers at your restaurant. The UpMenu system will make it possible to launch a reliable loyalty programme that will enable your customers to collect points or stamps for their orders. You can define all its terms. 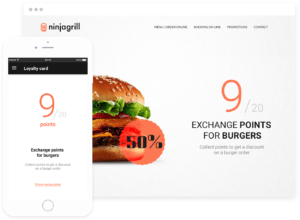 When using a mobile app for restaurant ordering your loyalty programme can also operate in the offline world; your employees can add points for meals ordered at the restaurant. Such a solution will create huge possibilities for you! It allows you to integrate the real world with the virtual world – online orders with customer visits to the restaurant. You can give your customers a certain sense of fairness – an online order will not differ from an order made at the restaurant. When a customer places an order through the online food delivery mobile app they know they are making an order at your restaurant. They expect the same level of customer services and meal quality. They also want to use all promotions in the same way. A loyalty programme is no exception here. 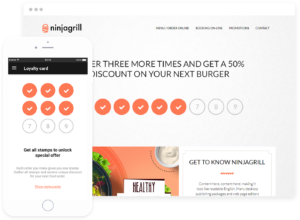 Such an integrated approach (a programme that works on the restaurant website, in the mobile application, and at the restaurant) will help you build loyalty and an image of a professional brand. This will convert into a larger number of orders executed at the restaurant, hence generating more profits. If you looking for information how does a restaurant mobile app with a delivery system work, check UpMenu software. A restaurant mobile app will ensure greater convenience for your customers and bigger profits for you. 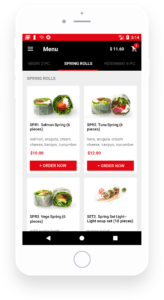 A native food ordering application, adjusted to the image of your restaurant, is a new sales channel that will ensure more online orders with all its functionality. The online food delivery application can be used by single locations as well as full restaurant chains. The type of cuisine is also not important. On the contrary! Thanks to its huge possibilities when creating a menu, adding extras, and configuring promotions, the restaurant mobile app will be ideal for any type of cuisine. Integration with fast online payments and additional marketing features are solutions that will be convenient for you and your customers and will contribute to increasing the number of orders at your restaurant. If you would like to launch your own native restaurant mobile app, please feel free to contact us! We will be more than happy to help you earn more from online orders!